At XM we offer Best Buy Co Inc. (BBY.N) stocks as cash CFDs. Our cash CFDs stocks are undated transactions that aim to replicate the cash price of the underlying stock, and so they are adjusted for any relevant corporate actions. Founded in 1983 and headquartered in Richfield, Minnesota, Best Buy Co., Inc. is a leading American corporation specialized in consumer electronics that sells cellular phones (such as Verizon Wireless, T-Mobile US, Boost Mobile, etc.). The company features a series of brands (e.g. Best Buy, Best Buy Mobile, Geek Squad), and ranks as the largest specialty retailer in the consumer electronics industry in the United States. Best Buy Co. is a S&P 500 component, and its stock is traded on the NYSE. *** Note that the maximum trading volume for Best Buy per client is 1438 lots. This limit will be reviewed on a daily basis and updated according to the value of the instrument. 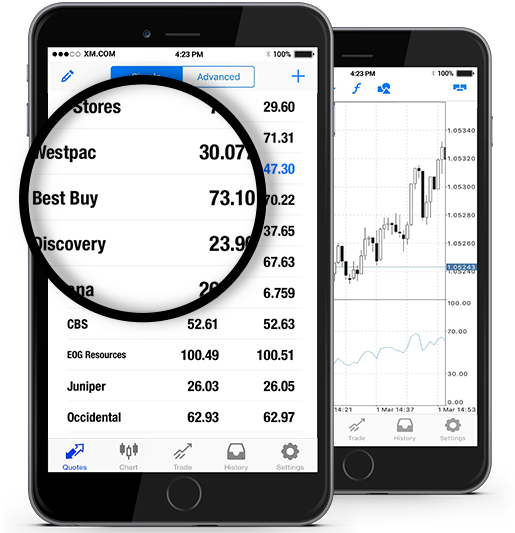 How to Start Trading Best Buy Co Inc. (BBY.N)? Double-click on Best Buy Co Inc. (BBY.N) from the “Market Watch” to open an order for this instrument.